The Schmitz’, that’s us. Mom, Dad, the twins, and I. Up until that morning when Schmitz’s cat walked into the kitchen to vomit, we were a completely normal family. Now we are famous. Everyone in town knows us. Even the pizza delivery guy, who visits Mom every day. For Mom doesn’t cook any more; she doesn’t even boil with rage. Mom is on strike. In Going off like Schmitz’s Cat, Frauke Angel, actress and multi-award winning author from Dresden, and illustrator Stephanie Brittnacher tell the story about the strike of mother Schmitz from the perspective of the son. From one day to the next, the father and the children find themselves in an exceptional situation: No food on the table, no freshly washed clothes, and an empty refrigerator. Mom makes herself comfortable in the garden and watches the family chaos unfold. 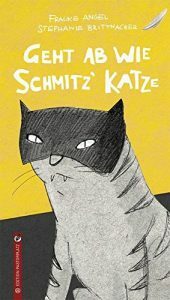 The illustrations follow Schmitz’s cat and show the drama from the pet’s perspective.